Jerusalem artichokes are to my mind a bit strange, but that doesn’t stop me from liking them. I like them cooked slowly until their flesh, apple-crisp and bitter when raw, softens and mellows invitingly. They do not become more attractive upon cooking, though–in fact they become, if anything, even more hideous. This is not a problem for me, personally, but I understand why their appearance would not reassure others upon serving. To assume that blending jerusalem artichokes into a soup is merely a way of side-stepping this small issue would do a disservice to this dish, though: it’s one of the best ways you can show their rich flavour and velvety texture. 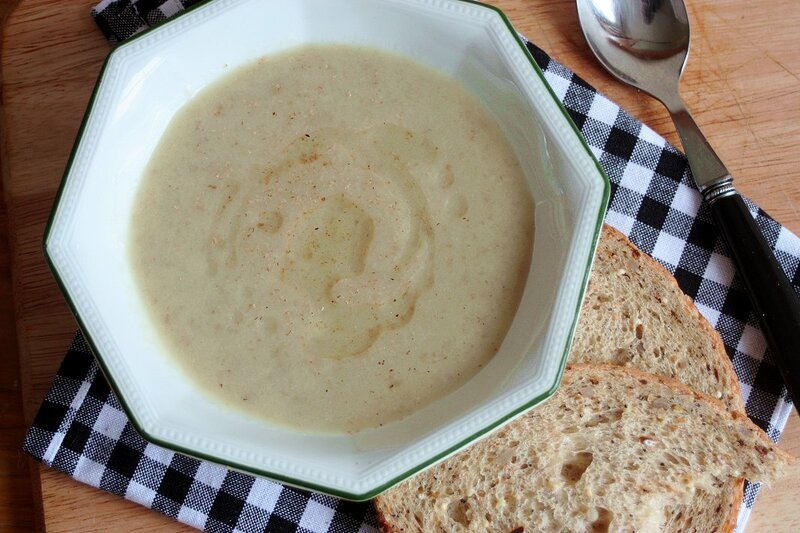 This soup is also very easy to make and requires few ingredients. The most time-consuming and involved part of the process is peeling the artichokes, which I think is best done with a teaspoon. You can easily work it round the knobs and into the crags, so you don’t lose so much of the flesh that way. The Kentishtowner’s original recipe is made with fresh rosemary; I only had sad and ancient dried rosemary, so I tried the soup with some nutmeg and found the subtle spice complemented the creamy, smoky flavour. But you, of course, can make it however you like. Give the jerusalem artichokes a good wash and scrub–even ones from the supermarket can still contain plugs of dirt. Peel them, scraping off the skin with a teaspoon. Slice them lengthways and set aside. Peel the shallots and the garlic, cutting off their roots. Slice the shallots in half, then chop them roughly. Slice the garlic. Melt the butter in a medium saucepan over a low heat. Add the shallots and garlic, stirring often, until softened and fragrant. Pour over the stock and bring to a boil over a high heat. Add the jerusalem artichokes, making sure they’re all submerged. Cover and lower the heat to a simmer. Cook for about 25 minutes or until the artichokes are very soft and can be crushed against the side of the pan with a spoon. Take the soup off the heat to cool slightly before blending. If you’ve got a stick blender, just blend it right there in the pan until smooth. If not, lift the vegetables out of the stock and into a blender (in small batches if required) to liquidise. Mix back into the stock and reheat, tasting and seasoning with salt and pepper if desired. Serve with a drizzle of oil and a good grating of fresh nutmeg. It depends on where you are, I suppose; here in the UK, they are available in ordinary, mildly to moderately posh supermarkets (e.g. Sainsburys, Waitrose), albeit larger ones and only when these vegetables are in season (December – February). 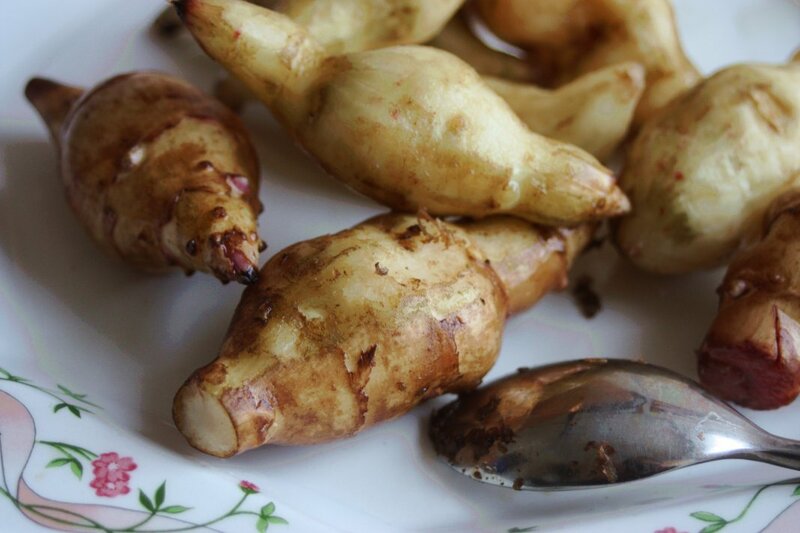 Jerusalem artichokes are very different from your usual artichoke. They are not really artichokes at all; they’re the tubers of a type of sunflower. They are similar to potatoes in that they’re starchy and mildly savoury, but the texture of their flesh is much more silky and the flavour has a slight rich smokeyness to it. This is why I think they’re a bit odd! They are a knobbly mystery vegetable, but I love them anyway. Glad to help! I know absolutely nothing about shopping in NYC so I can’t be of further assistance, but maybe places like farmer’s markets may have more of a variety of vegetables. In the U.S. they’re called sunchokes, which may help your search! I really like Jerusalem artichokes. The taste is, as you say, a little hard to explain. But one of the best dishes I’ve eaten this winter was a braised oxtail atop puréed chokes. Your soup looks wonderful!